55% of respondents ranked security as their top priority when considering current or planned IoT initiatives. "As industrial equipment is increasingly connected to the Internet for data collection and analysis, enterprises open themselves to the sophisticated world of security intrusions." 451 Research’s most recent Voice of the Enterprise: Internet of Things Vendor Evaluations survey found that security continues to be a major concern for IT professionals when deploying IoT projects within their organizations. When asked to rank which technologies or processes their organizations considered for current or planned IoT initiatives, 55% of respondents ranked IoT security as their top priority. As 451 Research data consistently shows, security is a headwind that must be overcome. Survey respondents have rated IoT security as their highest priority since the inaugural Voice of the Enterprise: Internet of Things survey in 2016 – but why? According to 451 Research analysts, some business leaders have stayed on the sidelines of IoT because they believe the risks are still too high against potential returns, but for those that do initiate IoT projects, security is still a top priority. 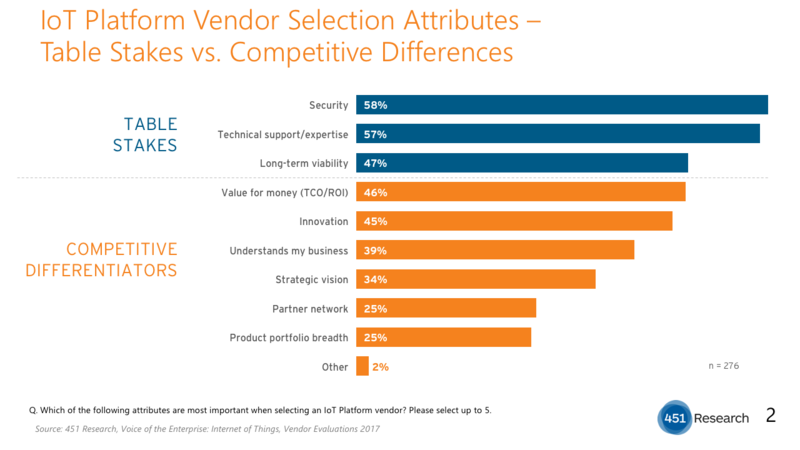 Beyond extolling IoT security as the top requirement in their IoT deployments, enterprises value security capabilities as the top reason for choosing a commercial IoT platform, with 58% of survey respondents ranking it as the top attribute in choosing a vendor partner. Furthermore, in an IoT Workloads survey in 2017, enterprises ranked the IoT attack vectors that most concerned them. At the top of this list were poor authentication of IoT endpoints such as sensors and network modules (64.3%), unsecured enterprise IoT applications (63%) and vulnerabilities in how end users access their IoT devices and applications. Ian Hughes, Senior Analyst for Internet of Things at 451 Research, will be moderating an “IoT Security & the Blockchain” session at GSMA’s Mobile World Congress in Barcelona on Monday, February 26. Joined by leaders from ARM, Cisco, KPN, Microsoft and Qualcomm, Ian’s session will focus on the need for an industry-wide consensus on IoT security guidelines, looking at the role specific technologies like blockchain can take in IoT. Learn more. Combining a proprietary panel of more than 60,000 senior IT buyers with our robust data-collection methodologies, 451 Research’s Voice of the Enterprise: Internet of Things, Vendor Evaluations tracks and analyzes the disruption occurring in the IoT market today and exposes the major opportunities for enterprises, IT vendors, suppliers and investors. The study represents more than 600 completes of a web-based survey, completed by IT decision-makers worldwide, primarily based in North America and Europe, and supplemented by 12 in-depth phone-based interviews In addition to regular quarterly topics, the survey also focuses on the general IT and IoT budgets, the nature and pace of IoT adoption, how organizations are transforming their IT environments, and the role of IoT technology in improving IT agility and digital business-readiness. Subscribers can access the full report here.